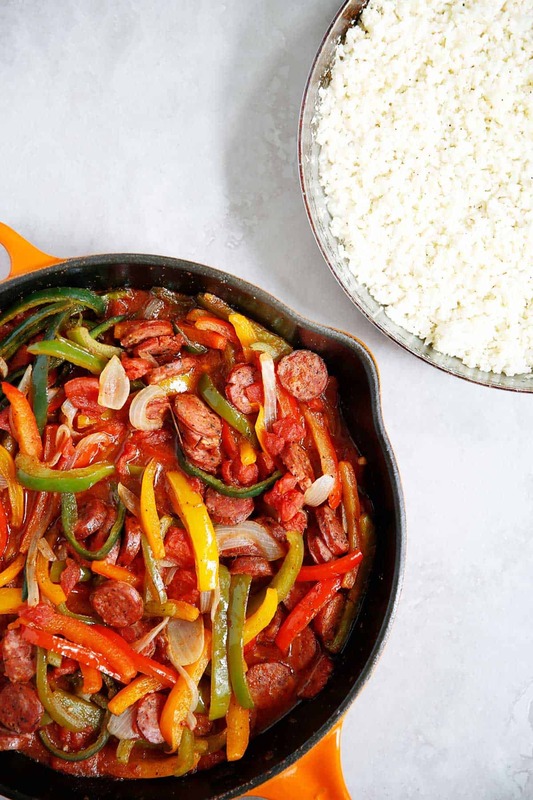 This low-carb and keto-friendly Sausage, Peppers, and Onion, one-pan dish is made in just twenty-minutes! Such a perfect sausage and peppers recipe for any night of the week. Did you know that peppers are at their growing season peak right now? I was over at my favorite little farm and they had a bin with the most beautiful looking peppers, so I just had to get a bunch! This dish went over big time here. This is the EASIEST sausage and peppers recipe! 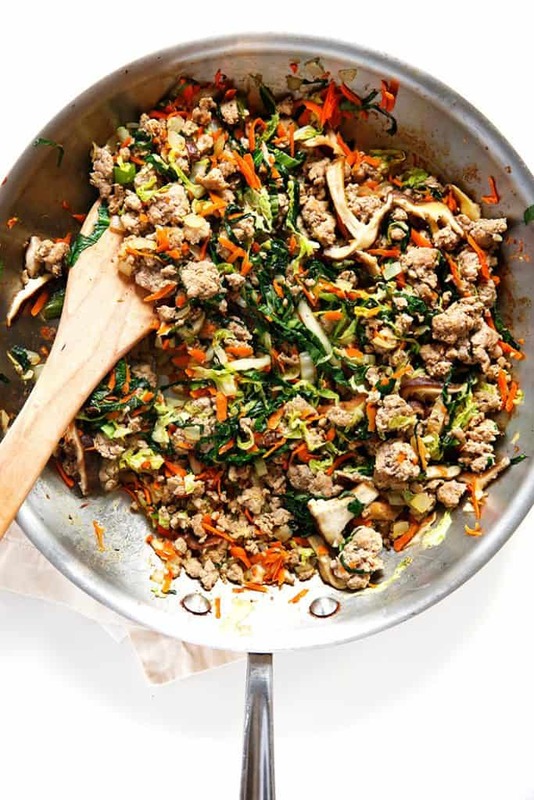 It is made in one skillet, is so flavorful, and you can use chicken sausage, pork sausage, or any sausage you like! I like to find ones with minimal added ingredients. It is flavorful, comforting, and just plain delicious with the perfect amount of sauce. A great dish for football Sunday or those nights when you need a quick and easy meal! You can get creative with how you serve this dish! I love it served over roasted spaghetti squash or cauliflower rice but I bet it would be great with gluten-free pasta or spiralized veggies as well! 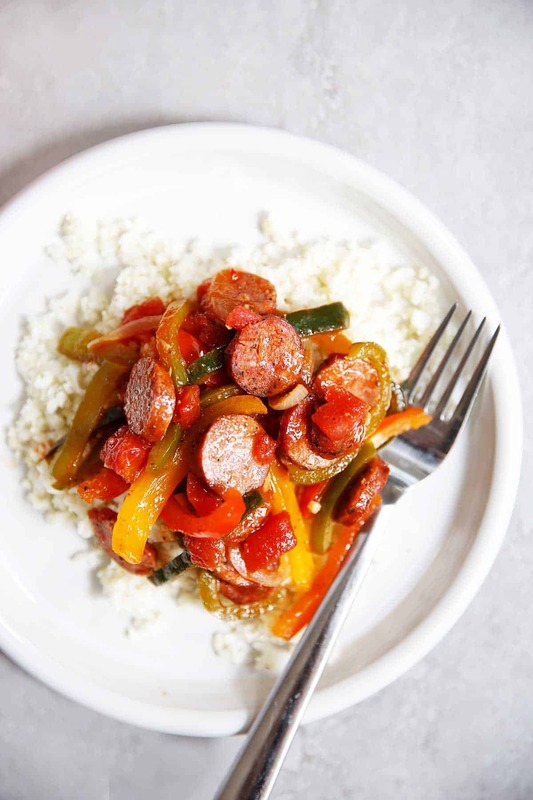 This sausage and peppers recipe is Paleo friendly, whole30 compliant, dairy-free, grain-free, and no sugar added! Like this easy skillet recipe? 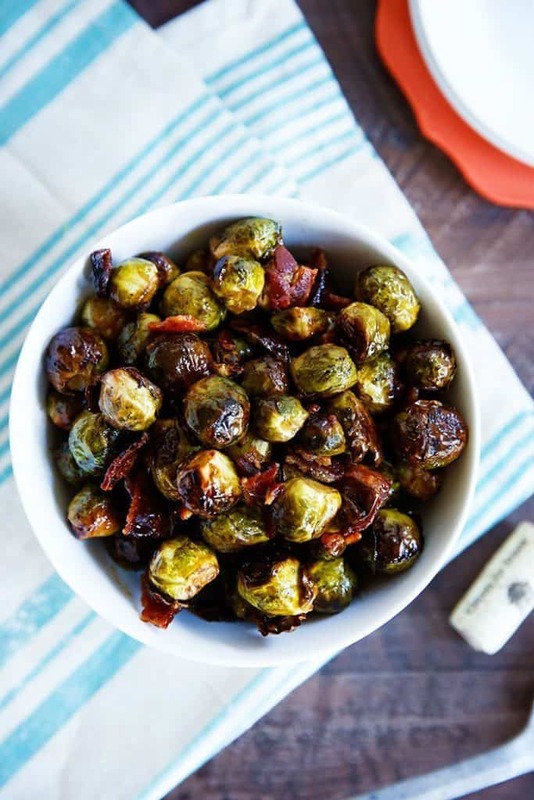 Try these other favorite one pan meals! Heat extra-virgin olive oil in a large skillet over medium-high heat. Once the oil is hot, add garlic and cook for 30 seconds or just until fragrant. Add sliced onions, bell peppers, and poblano pepper to the skillet; let cook until the onion is translucent. 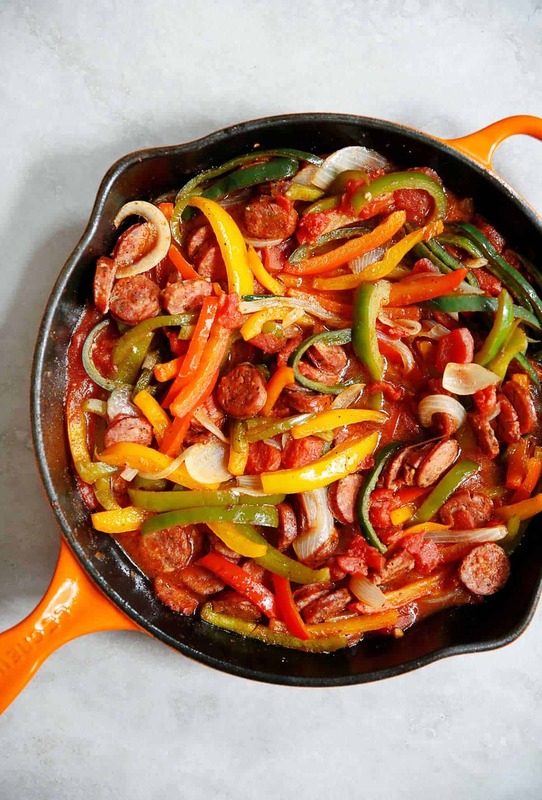 Add cooked sausage to the large skillet with the peppers and onions and cook for 1-2 minutes. Pour in diced tomatoes, chicken broth, and spices. Mix well. Bring to a boil then reduce heat and let simmer for 10 minutes. Serve over spaghetti squash, cauliflower rice, or gluten-free pasta! 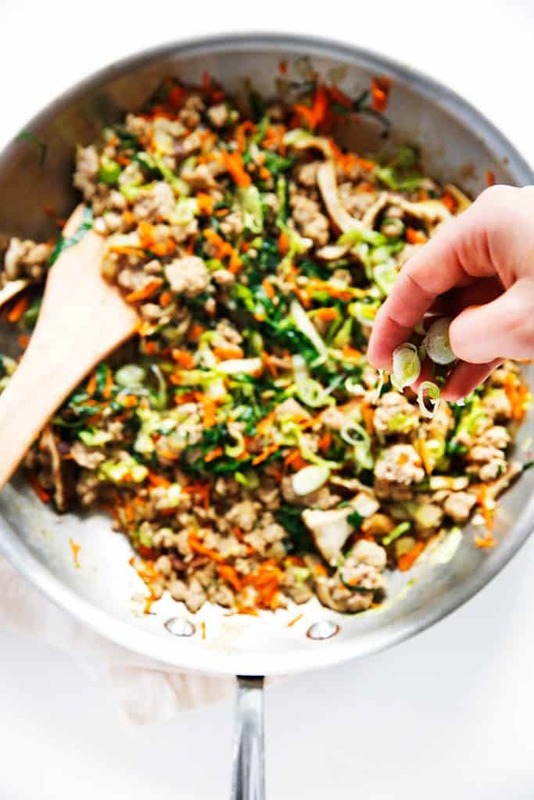 *If you are using uncooked chicken sausage, remove the casing and cook the chicken sausage and garlic together in a medium skillet over medium-high heat until the sausage is brown on both sides. This should take around 5 minutes, stirring often. 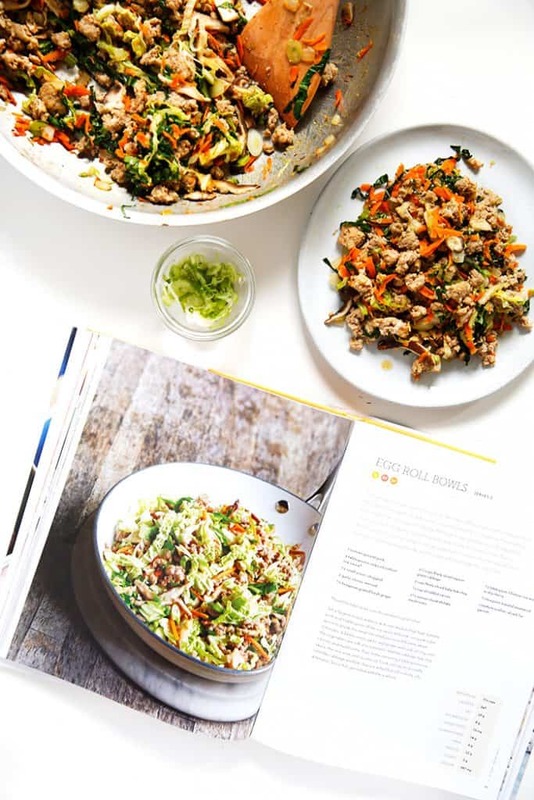 These Egg Roll Bowls are all of the delicious classic egg roll filling, without the junk! I am so thrilled that it’s finally release day for my fabulous friend Gina, from Skinnytaste! Gina is beyond sweet, so genuine, and so talented! 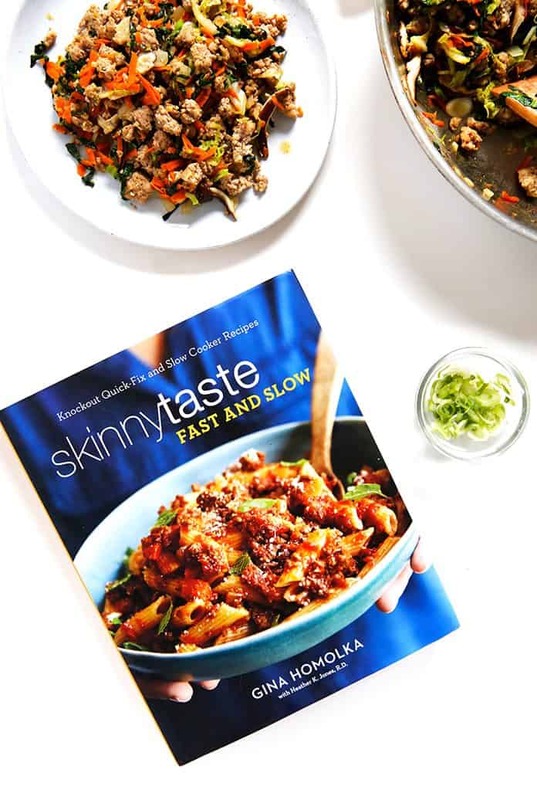 Her new cookbook, Skinnytaste Fast and Slow, is now available in stores everywhere, and it is TRULY an amazing and beautiful resource. Gina’s hard work does not go unnoticed in this cookbook! All of the recipes are either cooked slow in the slow cooker, or are quick under 30 minute meals. My two favorite things! I am so thrilled to share this recipe with you today. We devoured it so quickly! 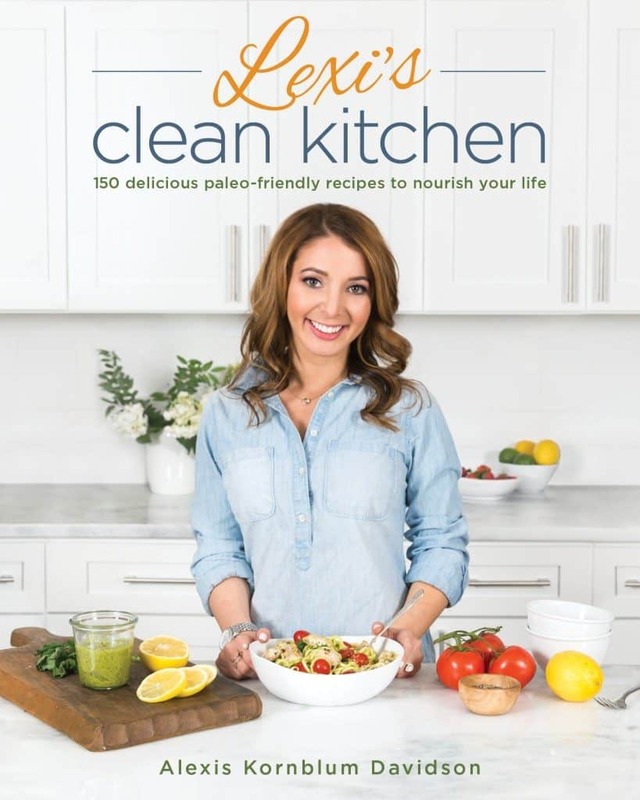 Gina has a whole chapter on TACOS (my favorite), and recipes like Slow Cooker Lasagna Soup (page 53), Slow Cooker Maple Dijon Chicken Drumsticks (page 167), Slow Cooker Carne Desmecjada (page 195), Slow Cooker Vanilla Bean Pear Butter (page 291), and Slow Cooker Pumpkin Flan (page 298). I just cannot wait to get cooking! Congratulations, Gina! 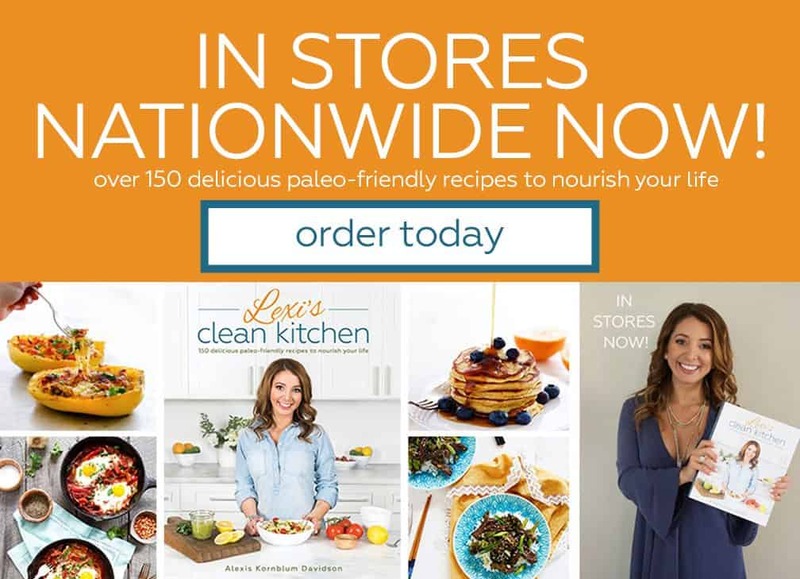 Find her newest cookbook in stores everywhere books are sold, or on Amazon! It’s a must-buy! 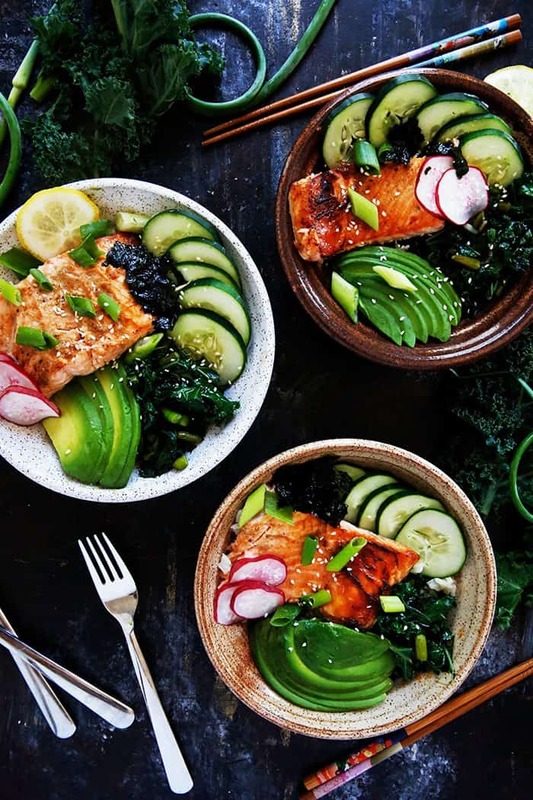 These Grilled Fish Bowls with Garlic Scapes and Kale makes for the perfect summer meal in a bowl. 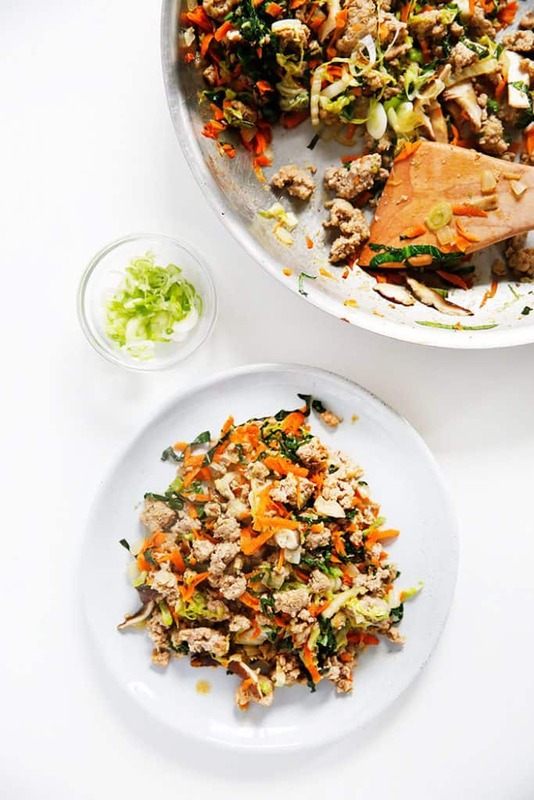 Packed with flavor and fabulous ingredients, this dish is packed with everything you need for a delicious and nutritious lunch or dinner. Last year was my first year of joining a local CSA and frequenting my new town’s farmers markets. I came home week after week with incredible amounts of produce, many of which at a loss of what to do with. (P.S. if you’re looking to save money eating organic, a CSA is an amazing resource). I hate to say it, I wasted a lot last year. I often didn’t use up all of those more unique ingredients. But not this year. 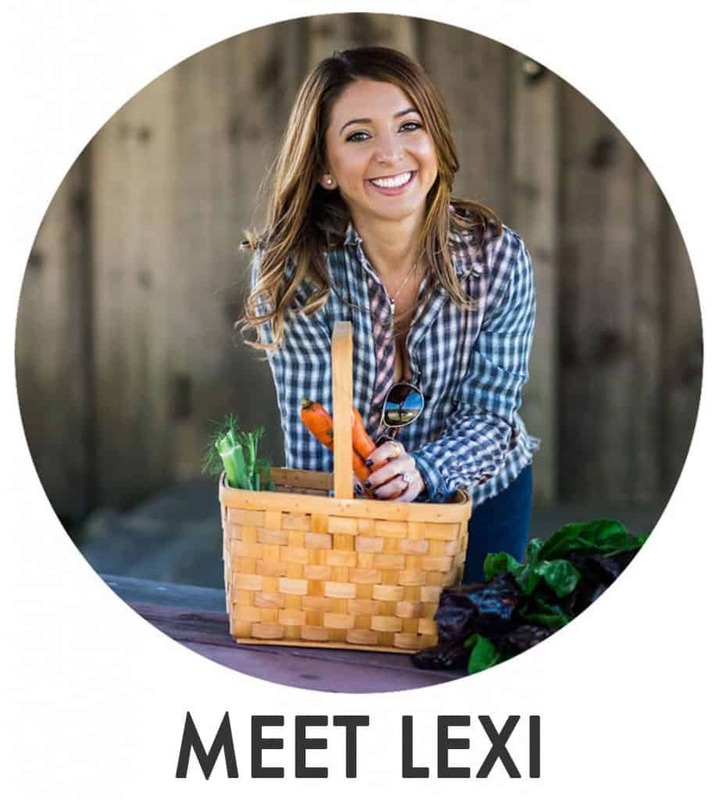 This year, I’m teaming up with my fabulous friends Juli (from PaleOMG) and Cassy from Fed and Fit to bring you a recipe a week inspired by our CSAs and Farmer’s Market hauls! That’s right. Every week you’ll get THREE delicious recipes to inspire you to cook something new, try a new ingredient, or just enjoy that fresh local produce! Part of my first haul! 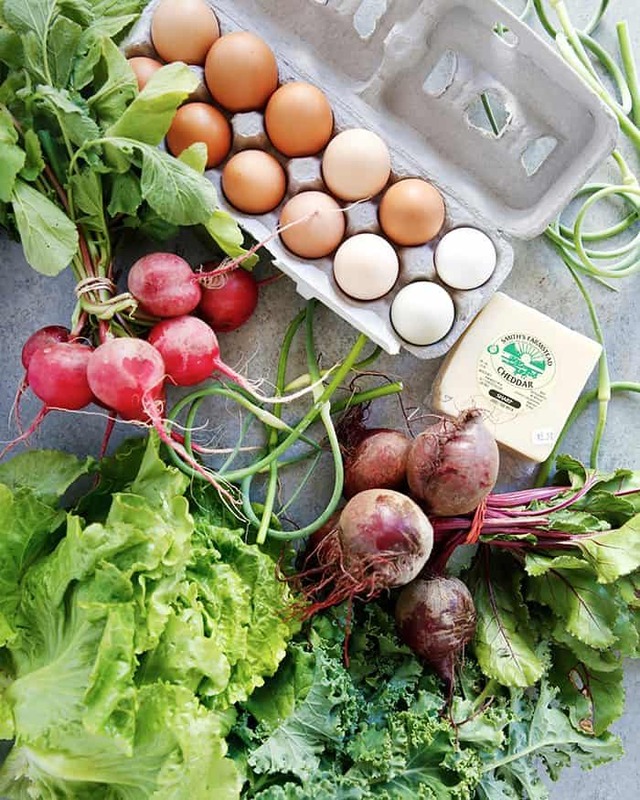 If you’re looking for a CSA in your area, this website is a good resource on how to find one! Everything is better in a bowl. Seriously! This week let’s use up some kale, garlic scapes, scallions, and cucumber! Now, let’s see what my fabulous friends made this week! 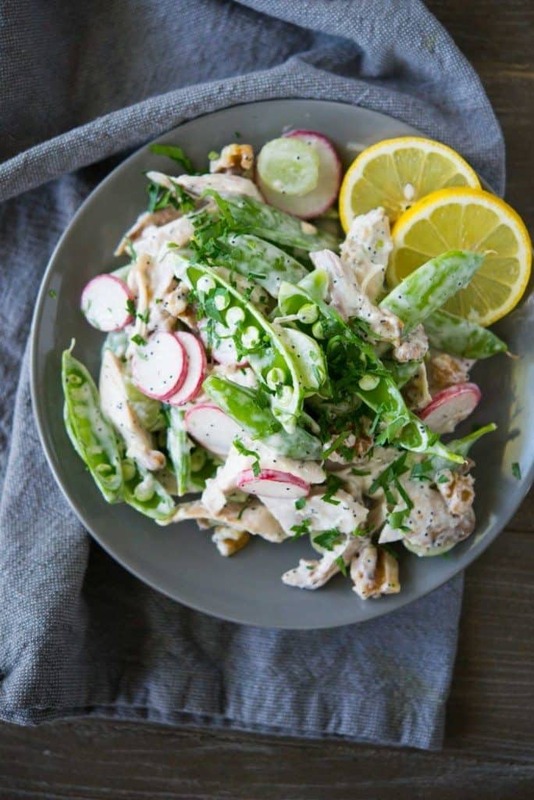 Cassy made you a delicious Chicken Salad with Snap Pea Radish Slaw! 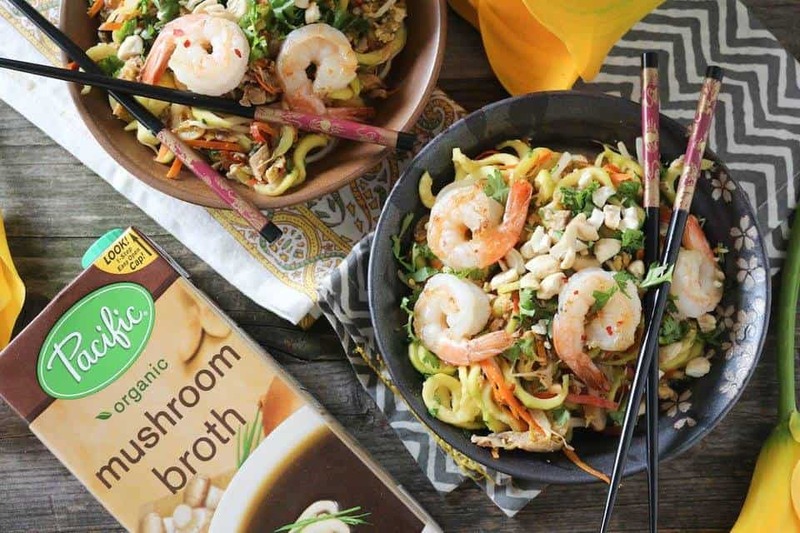 Juli made you a Zucchini Pad Thai with Shrimp! I can’t wait to devour these recipes! Check back every Wednesday for the next two months for recipes to cook through those market and CSA hauls! What ingredients are you hoping to see get used in this series? 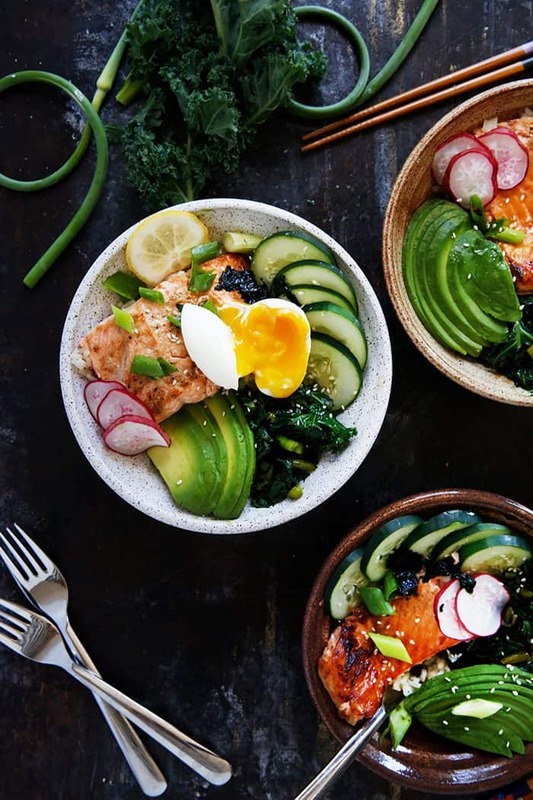 In a bowl whisk together fish marinade ingredients and pour over fish. Let sit for 10 minutes or up to 1 hour. Cook fish inside: Place broiler on high. Place fish on a lined and greased baking sheet and broil for 7 to 9 minutes depending on the thickness of your fish. Add sesame seeds to garnish. Cook fish on the grill: Grease grill and heat to medium. Place fish on a sheet of tin foil and cook for 8 to 10 minutes until fully cooked to your liking. Add sesame seeds to garnish. In a skillet heat oil and garlic scapes and sauté until kale is wilted and garlic scapes have softened slightly. Assemble bowls: Add rice to each bowl. 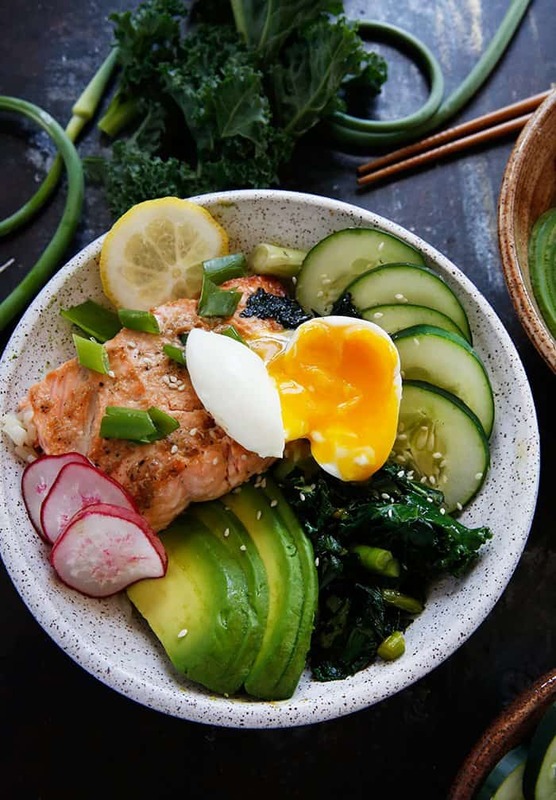 Top with kale mixture, salmon, avocado, cucumber, egg, scallions, and radish slices. Serve and enjoy. 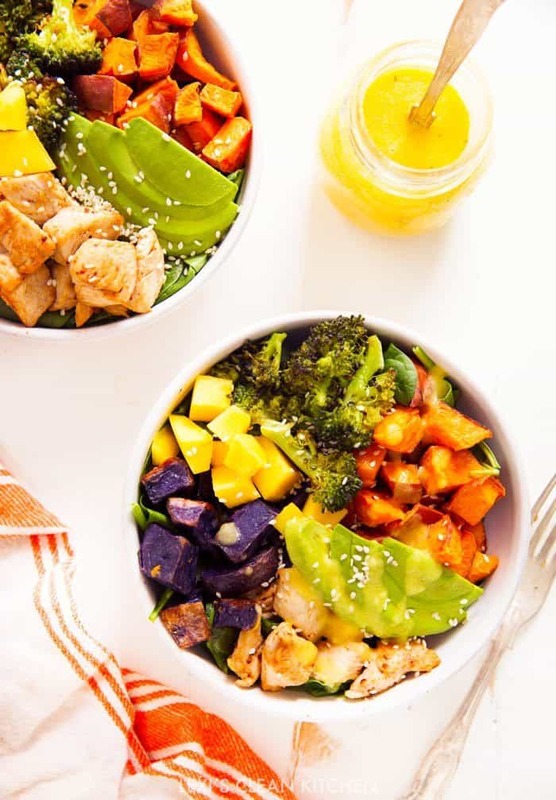 Throw together this flavorful Chicken Buddha Bowl with Spicy Mango Sauce packed with spicy broccoli, roasted sweet potato, avocado, and MORE. Top it with this light spicy mango sauce for a perfect and hearty lunch or dinner. I’m obsessed with meals in bowls right now! Something about it just speaks to me. 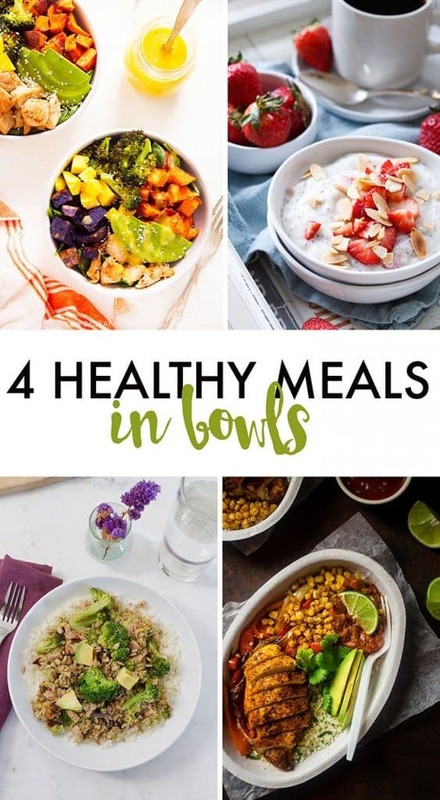 This month with my blogging girlies, we’re bringing you 4 healthy meals to eat in BOWLS and I’m so excited about it. 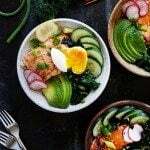 Put that can of tuna in your pantry to good use with this inexpensive, easy and flavorful Broccoli Avocado Tuna Bowl recipe. Make your own healthy, gluten free and paleo-friendly Chipotle Burrito Bowl at home with this quick and easy, 30 minute recipe! 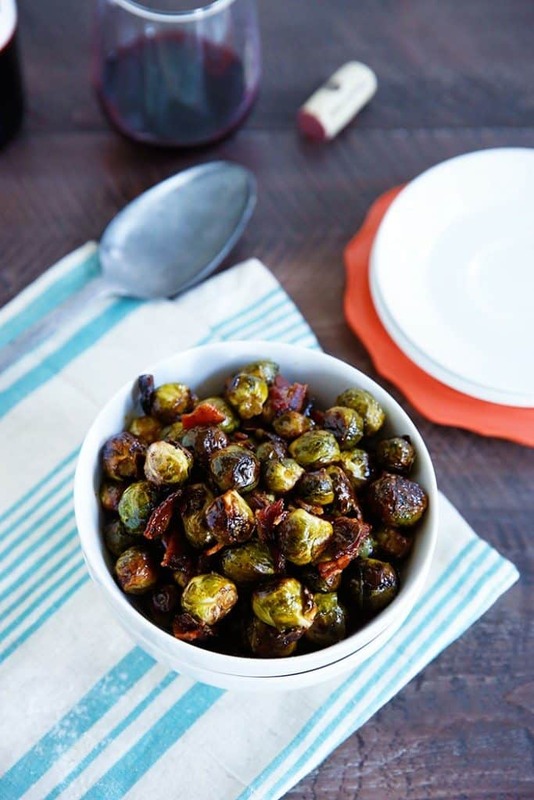 It’s perfect for busy weeknights and under 450 calories! These protein packed polenta breakfast bowls are made with creamy coconut milk and filled with juicy ripe spring strawberries for a sweet start to the day. 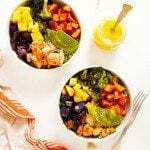 Now, my Chicken Buddha Bowl with Spicy Mango Sauce. 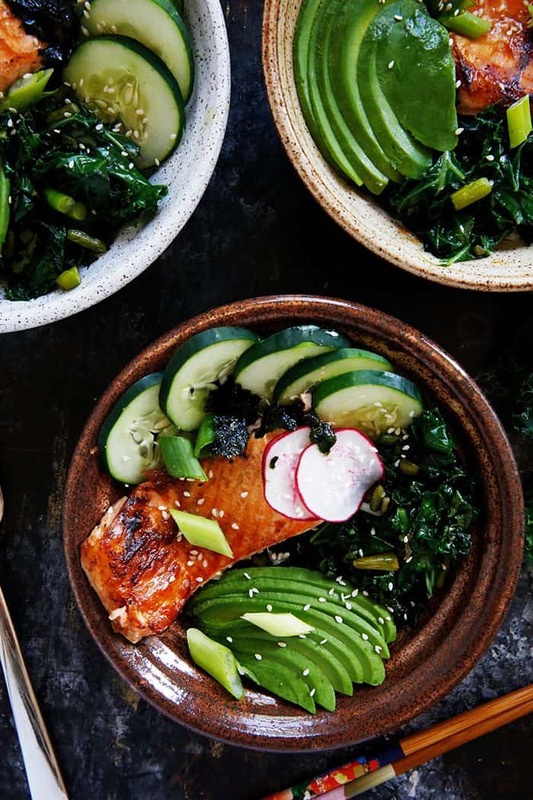 What exactly is a Buddha bowl, you may ask? Generally, it’s a combination of: Grains, Protein, Veggies, and Toppings/Dressing. I swapped out the grains for spinach and kale, but this bowl is awesome with some cooked white rice, too! 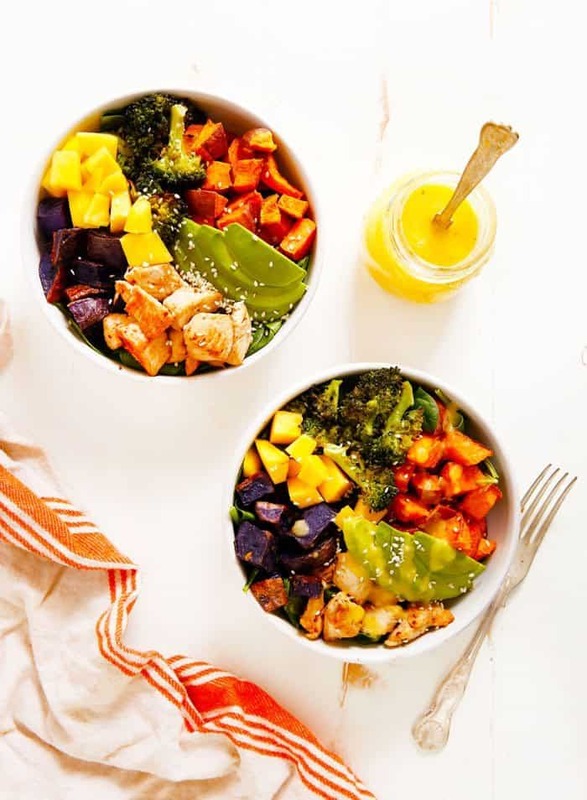 I love it because it’s customizable to what you have on hand, and absolutely anything and everything is awesome with this Spicy Mango Sauce on top! If you have a rotisserie chicken made, chop it up and use that. Have no chicken made? Dice, marinade, and cook in a skillet. The options are endless and all results in a delicious and nutritious meal. In a high-speed blender, blend Mango Sauce ingredients and set aside. On two lined baking sheets, toss sweet potatoes with oil and salt on one, and broccoli with olive oil and sauce on the other. Roast for 45 minutes until fork tender. When done, toss broccoli with chili paste. Place 1/2 cup of greens in each bowl and rice if adding. 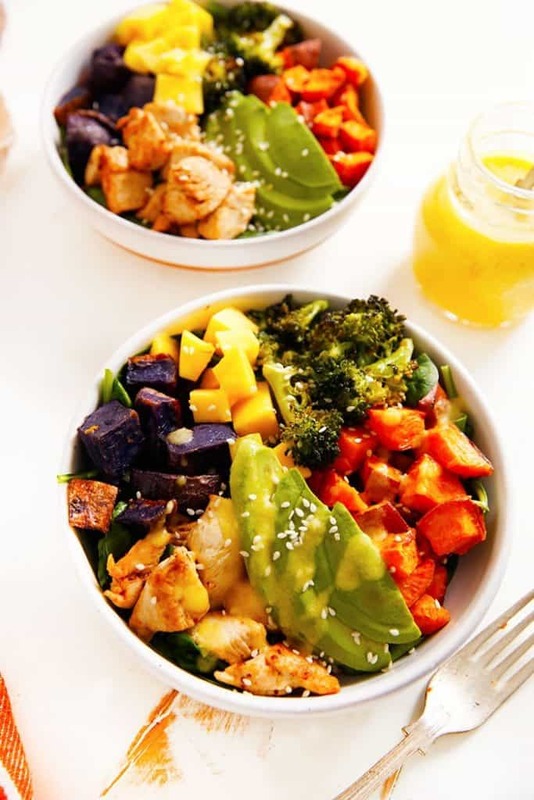 Top with roasted potatoes, avocado, chicken, mango, and drizzle or toss with sauce. Adjust the amount of potatoes, broccoli, mango, and avocado to your desired amount! 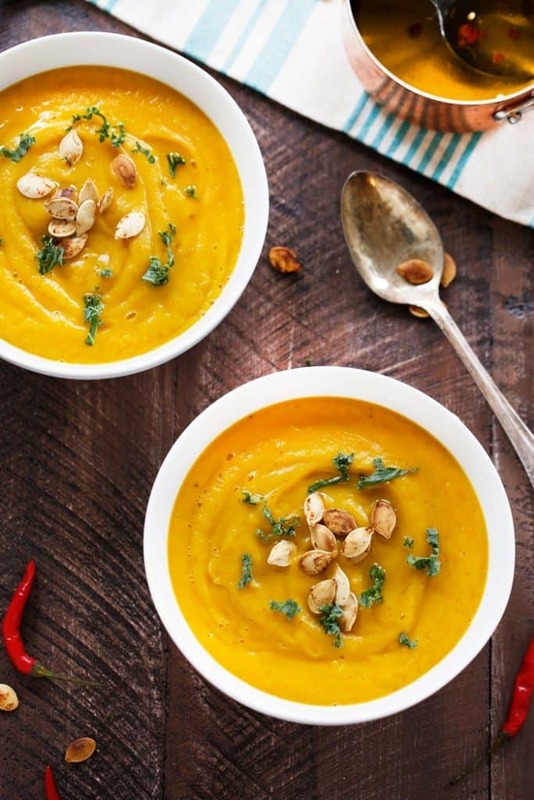 This Easy Pumpkin Soup is creamy, flavorful, smooth, and garnished just right with Chili Garlic Oil and roasted pumpkin seeds! It’s perfect for the fall season, and for any holiday gathering! This soup comes together quickly and is paleo-friendly! How do you make a pumpkin soup? October has me feeling all Fall! It makes me realize how much I truly love this season. The weather has been just right, and I am loving all of the Fall flavors popping up in my CSA! 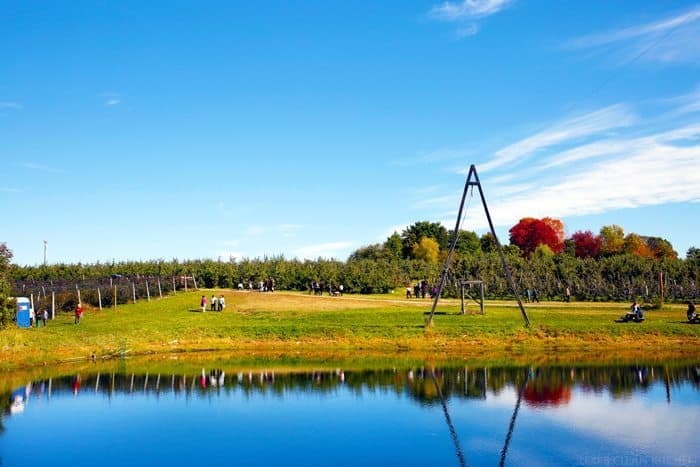 I purchased some amazing blanket scarfs, my boots are out and in use, and this past weekend we went apple picking! The foliage in New England is really starting to shine in only the way it can in New England! So beautiful. Today is special. 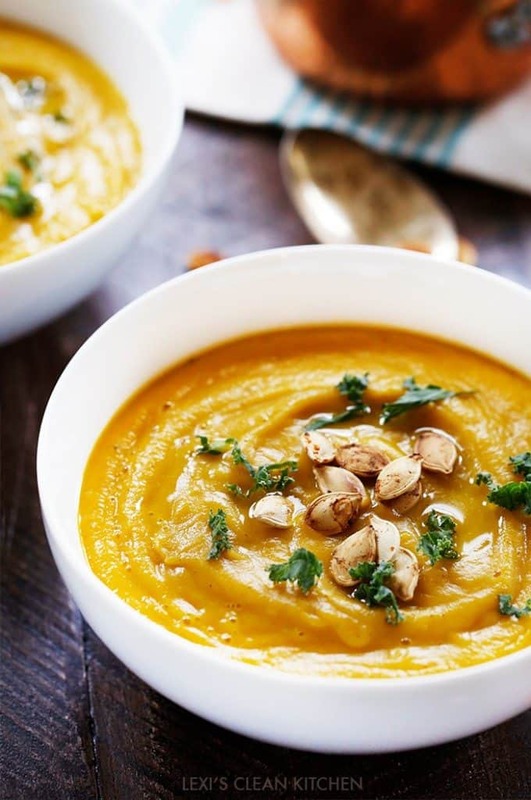 Not only am I bringing you my delicious (and easy) pumpkin soup, but my girlfriends and I have SIX total pumpkin recipes to get you through the next two months. Can you taste that creamy goodness? OH. YEAH. 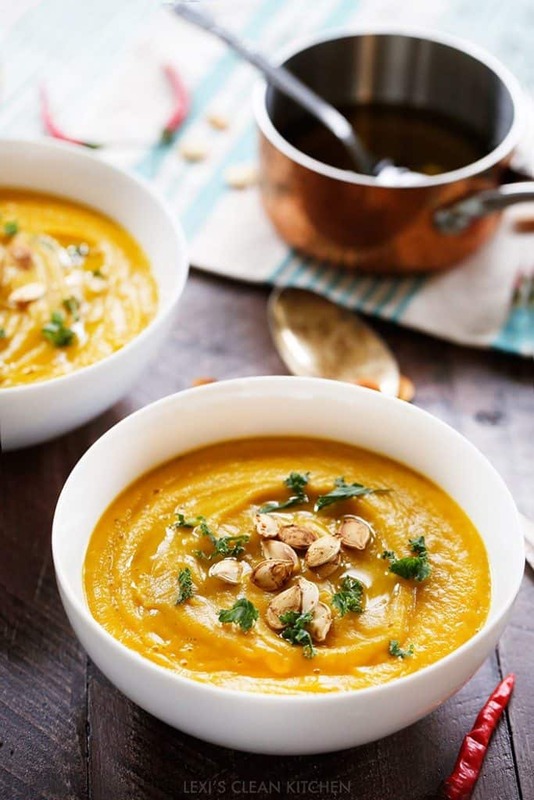 This is the perfect Fall soup for all of you pumpkin lovers! Delicious, flavorful, and packed with nutrients. Creamy pumpkin topped with a drizzle of chili garlic oil and roasted pumpkin seeds. You’ll enjoy this soup all season long! Follow these directions to roast pumpkin and pumpkin seeds. In your dutch oven heat oil and sauté garlic and onion for 5 minutes. Add in cubed pumpkin and mix to combine. Add in chicken stock just covering the pumpkin, spices, and maple syrup. Bring to a boil then reduce heat and let simmer, covered, for 10 minutes until pumpkin is soft. Transfer to your high-speed blender and blend until smooth. Taste and adjust spices as desired (i.e. more salt, pepper). In a small pot, heat oil with garlic and chilis. Let cook for 5 minutes, stirring often. Strain and set aside. Garnish soup with roasted pumpkin seeds and optional garlic chili oil! Let’s get to these recipes! Pumpkin, coconut milk and chia seeds are combined and topped with toasted coconut flakes and an almond butter drizzle to make a thick and creamy chia pudding that’s paleo-friendly, vegan and great for breakfast or as a snack. These pumpkin blondies are so dense, and sweet that you’d never know they’re a healthier treat for only 105 calories! They’re paleo and vegan friendly too! Get festive with your breakfast and make these delicious Paleo Pumpkin Pancakes that are grain-free, packed with pumpkin, and paleo-friendly! 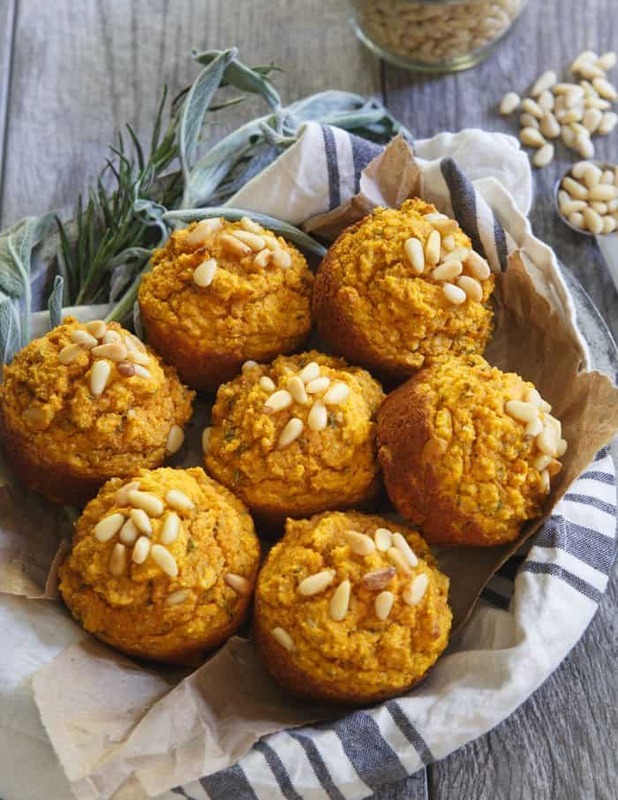 Paleo toasted pine nut herb pumpkin muffins are a savory side perfect for serving with your fall soup, stew or chili. Maybe even replace the Thanksgiving biscuits this year with a basket of these! Healthy Pumpkin Spice Freezer Fudge made with just 5-Ingredients! Free of refined sugar, dairy and gluten, this healthy dessert recipe will make you fall in love with fall.